15TH AND 16TH CENTURY After the storms and floods of the 13th century that created new lakes and inland seas, changing the landscape dramatically, and the rapid land subsidence caused by the colonization of the peat wilderness, all had somewhat stabilized now around 1400 AD. Out of necessity, the land becoming too wet for most crops, farming had switched to large scale dairy production. With cheese proving to be a perfect non-perishable export article. As less hands were needed on the farms, towns were steadily growing. By 1500 more than half the population lived in towns, the highest degree of urbanization in Europe. The towns were many in Holland and at short distance from each other, but small - not more than a few thousand inhabitants. Holland and its merchant navy was slowly becoming an important factor on the seas. With Amsterdam growing to be the main trading place. But Holland was by far not yet the most powerful part of the Netherlands. The real big towns and trade centres were still to be found in the southern Netherlands: Antwerp, Brussels, Ghent, Bruges (all in Belgium) and Lille (in France). Anyway, the Netherlands did not exist yet as a nation. It was a loose league of independent states. Each with specific traditions and diverging interests. Evolution towards unification was very slow. It's only in 1548 that all parts were formally joined in the 17 United Netherlands. There was certainly nothing more than a vague notion of belonging to one country. Prime loyalty still was with the own village or city, and region. Sure, people noticed many similarities. But each part had its specific history, traditions and even language. For example, because of history Holland and the eastern northern Netherlands were in a very different economical situation during the 15th century. The east had long established trade relations within the Hanseatic League, a confederation of merchant towns in the Baltic and North Sea coastal areas. Old and proud Dutch cities like Kampen, Deventer and Zutphen were prominent members of the club. The principal seat, or "kontor" for the Netherlands was located in Bruges. Later moved to Antwerp. The Hanseatic League cities were all protecting jealously their trade privileges, and were not too interested in sharing with those newcomers in Holland. 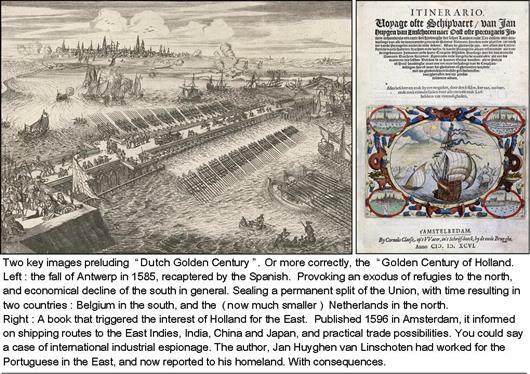 So, Holland, with merging powers like Amsterdam, went largely its own way. Although pragmatic Amsterdam did eventually join the Hansa, it tried, whenever possible, to make direct deals in the Hanseatic sphere of influence. Resulting in armed conflict with her Hansa "partners", naturally. An alert and aggressive new player in the field, that's what Holland was. With success. The Hanseatic League had dominated since the 13th century, but was now in decline. Holland, and Amsterdam, more than eager to take over. Gradually, Amsterdam was on its way to become the main port of transfer between north-eastern Europe, and the south. The staple market for grain from the Baltic to feed a large part of Europe, and timber from Scandinavia. For Amsterdam, the Baltic trade would remain vitally important throughout the centuries. With good reason, it was called "the mother trade". By and large far more money was made with this Baltic trade than in later years with the exotic voyages to the East and West Indies. Less spectacular, but a low risk solid base for business and prosperity. Above : Dirck Jacobsz. (1529) - Below : Cornelis Ketel (1588) - click on image for a high quality view of the paintings on the Rijksmuseum website. Two militia group portrait paintings, about 50 years apart. In both cases prosperous self-assured Amsterdam citizens. But what a difference in appearance and flair! And what happened with northern restraint and austerity? Although, somehow if feels like they were not yet fully comfortable in their new surroundings. When you look at comparable settings of the next century, the "Golden Dutch Century", it is clear that by then they were beyond feigned modesty. (click here for example). From early in the 16th century, protest and calls for reformation of the almighty Catholic church had been swelling. 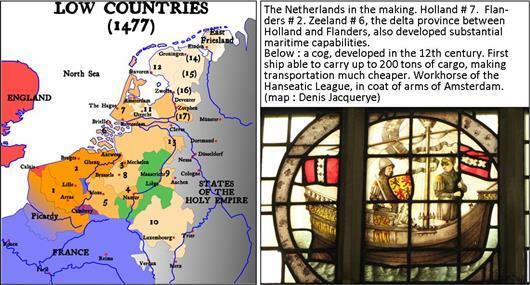 By that time the Netherlands were one of the most populated and urbanized parts of Europe. With for the time an exceptionally high degree of literacy - one explanation for widespread unrest. Especially in the industrial centres of Flanders, and the big cities in the south. This to the dismay of the very Catholic emperor of the Habsburg empire. His realm including the Netherlands, and Spain with her worldwide possessions. The situation remained more or less stable under emperor Charles V. He had some credit here, was born in Gent, grew up in Mechlin, spoke the languages. But when his son, Philip II, decided to move permanently from Brussels to Spain, and rule from there, the gap widened. Making it even harder to carry out his sustained policy of centralization. If one looks at it objectively, the aim was for a more modern state organization. But it also implied stricter taxation and less regional autonomy. These two items were felt as a deprivation of liberty, and fueled even more discontent than religious matters for most people. The long distances between Brussels and Madrid did not help communications either. In the 1560s a combination of crop failure and famine, recession and political blunders sparked off open revolt against Spanish rule. The start of the Eighty Years' War (1568 - 1648), the cradle of the (Northern) Netherlands as a brand new state. The Eighty Years' War had far-reaching consequences for both North and South. Lille : 60.000 > 33.000 * by 1650, the Amsterdam population had boomed to 140.000 inhabitants, by 1700 to 200.000. In the first dramatic stages of that long war of independence, the fate of the free Netherlands hung by a thread. Even those small patches of liberated territory in Holland and Zeeland were under constant attack by Spanish troops. Basically, it were desperate common people using mostly guerrilla tactics against the best professional soldiers of Europe. Making the fighting extremely gruesome. Another element that shocked the foreign troops : women in several threatened cities decided that they had enough of being passive victims of the invading armies. They started to participate actively in the struggle. Like during the siege of Haarlem, in 1572 - 73. Where one woman became famous, right up until today.